About "ESV Wonder Journaling Bible"
In our fast-paced world, we rarely pause to reflect, but we need to carve out time to process our thoughts so that we can effectively live in the present and successfully navigate the future. Spending time in God's Word strengthens our relationship with Jesus and reinforces our faith. When we bring consistency and purpose to this daily ritual we can see a story unfold in our own lives as we enter a dialogue with God. We listen and respond, writing down the truths that are being revealed. As we journey through the Bible, God speaks to us, we speak to God, dreams are formed, ideas created, prayers spoken, questions answered.The modern trends of journaling and mindfulness show the significant connection between engaging your thoughts, articulating them onto paper, and experiencing a happier and more peaceful life. But journaling is not only a path to increased self-awareness, it is an invaluable tool when allowing God's Word to take full effect in our lives. In Proverbs 4:20-23 it says:My son, be attentive to my words; incline your ear to my sayings. Let them not escape from your sight; keep them within your heart. For they are life to those who find them, and healing to all their flesh. Keep your heart with all vigilance, for from it flow the springs of life.We need not waste the lessons learned, forget the prayers we're believing for answers to, or lose the power of the small breakthroughs. 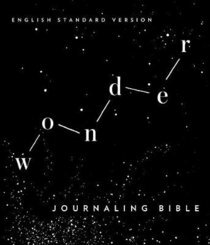 Wonder Journaling Bible is designed to accompany you on the journey. Unclutter your heart and mind as every day you grow in the wonder of God and are reminded of all He has done and the plans He has for your future.